An audio recording from inside Saudi Arabia’s consulate in Istanbul proves that missing journalist Jamal Khashoggi was brutally tortured and killed while the Saudi consul general looked on, Turkish officials claim. Details of the purported recording were published Wednesday in Yeni Safak, a pro-Turkish government daily newspaper. The recording captures how Khashoggi was killed in the office of the Saudi consul general, Mohammad al-Otaibi, just moments after he entered the building on Oct. 2, according to the report. A team of Saudi interrogators reportedly severed Khashoggi’s fingers while he was still alive. After killing him, they beheaded and dismembered his body for easier disposal, according to the details of the recording published by Yeni Safak. Details of the recording come amid increasing diplomatic fallout over Khashoggi’s disappearance. The affair has strained relations between Washington and Riyadh and drawn international scrutiny on Saudi Crown Prince Mohammed bin Salman, who has been widely portrayed in Western media as a socially moderate reformer. Riyadh has publicly denied abducting and killing Khashoggi, who was last seen entering the Saudi consulate to obtain marriage documents. But Saudi officials have not offered any evidence to back their claim that the journalist, a prominent regime critic, walked out of the consulate on his own accord. The account of Khashoggi’s fate published in Yeni Safak was confirmed Wednesday by The New York Times, which cited a “senior Turkish official” who described the contents of the audio recording. Prior to TheNYT report, The Wall Street journal reported late Tuesday that Turkish officials have shared evidence, including the audio recording, with U.S. and Saudi officials that backs the claim that Khashoggi was murdered by a team of Saudi agents, some of whom have known connections to the crown prince. 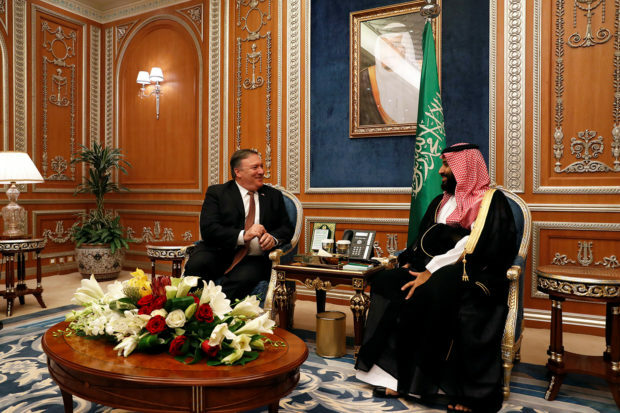 Secretary of State Mike Pompeo, sent to Riyadh by Trump to discuss the matter with Saudi leaders, accepted assurances that the kingdom would “conduct a thorough, complete, transparent investigation.” When asked if he had pressed Saudi leaders on whether Khashoggi was alive or dead, Pompeo said his whereabouts were not a topic of conversation.